How to sleep properly on your DreamFlow(R) Pillow to minimize pain and get relief to sleep comfortably. Many people experience more sleeping comfort in the first several days when using a pillow that offers proper support for the neck. Others may require an introduction period when beginning to use this pillow. It offers excellent neck and head support, which is something your muscles and spine might not be used to because your previous pillow didn’t support you well. For perhaps a week or more, you might want to keep your old pillow nearby so that you can switch to it in the middle of the night if you need a respite. You may experience neck or upper back discomfort, stiffness, headaches or muscle soreness when first using this pillow, and this is completely natural and normal. 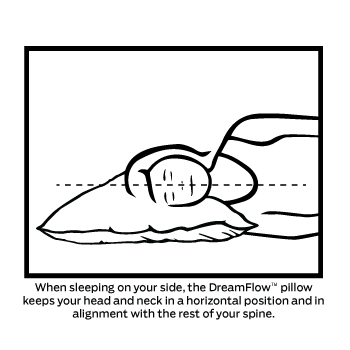 Just allow your body some time to accommodate and acclimate to the support offered by the DreamFlow® Pillow and soon enough you’ll be comfortably sleeping through the night with good neck and head support. Please read the following instructions for using your patent-pending DreamFlow pillow. The desire is for you to have a comfortable, rejuvenating and blissful slumber, so please be sure to use the pillow correctly. It may take a few days to adjust to the DreamFlow pillow, so if you feel a bit stiff or uncomfortable during the night or the next morning, this would be normal during your initial use period. When washing this pillow, please use cold water on a gentle cycle and use only the air cycle in the dryer, with a tennis ball if you'd like. Please do not use any heat settings as it will result in a clumping of the fibers that fill the pillow and may make it uncomfortable to use. If you perspire a significant amount while you sleep, or sleep with wet hair, it is recommended that you use a waterproof pillow protector over the pillow and then put your pillow case over it. This will keep the pillow dry so that clumping and degradation of the fibers doesn't occur. Following these instructions will allow your pillow a good long life of enjoyment.